At times the urban landscape requires alpine performance. Stylish, warm and stormproof, the Therme Parka delivers truly waterproof, windproof and breathable,weather protection on the harshest days. The Therme uses an N150p-x GORE-TEX® 2L fabric outer that has a soft hand, supple feel and still delivers longwearing performance. All seams are taped for maximum waterproofness. The Coreloft™ insulated hood offers full protection with added warmth. 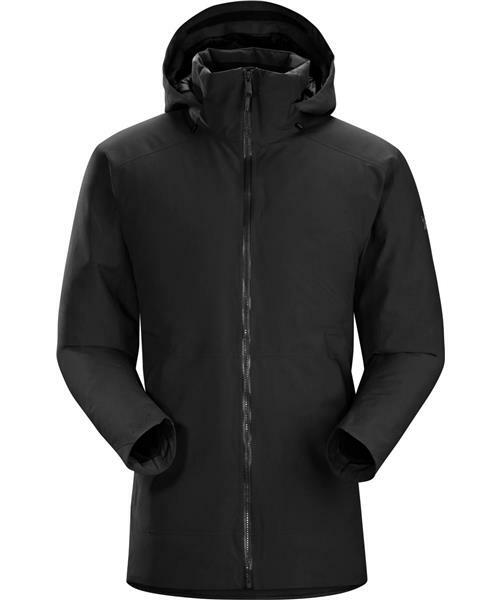 The Therme is a modern, refined parka streamlined for urban environments. To accommodate diverse situations, the hood may be easily removed to create a crisp, clean look at the collar. The point of attachment is designed so that when the hood is removed, there’s almost no sign it was ever there. Freedom of movement comes from articulation in the sleeves and gussets under the arms. The hem falls to the upper thigh for effective protection without excessive bulk. The Therme’s hand pockets have discreet hidden zippers, and an internal security pocket safely holds a smartphone, wallet or passport.